As cautioned in my pre-market calls, the negative news on Banking sector in India resulted in a fall in the markets, particularly in Banking. ICICI, Axis Bank and HDFC Bank fell between 1-4%. ICICI Bank opened below previous day’s close and was facing continuous selling pressure. I alerted the readers here to short on crossing the pivot. ICICI crossed below pivot and finally was down by more than 4%. 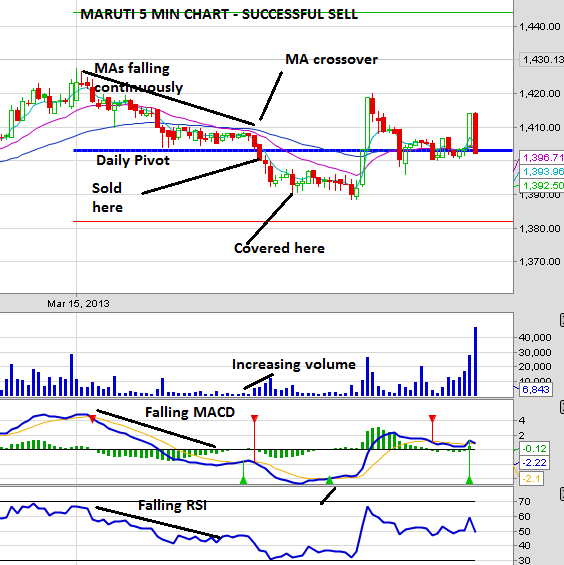 Please see charts for more dtails on the trade. 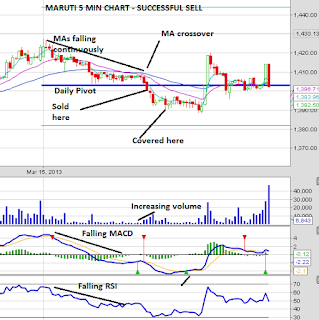 Maruti fell below the support level of 1410 and finally crossed the pivot from above. I alerted the readers here real time and traded short. Please click on the chart for more details. L&T was hitting the resistance level of 1530 several times and could not move up. Subsequently it fell down and crossed the pivot of 1410. MACD never recovered above zero though in between the stock made an attempt to move up. Finally there was a dip allowing us to book profits. Please click the charts for more details. Hope you too made profits. Please share your feedback and what else you would like to see from my posts. I will be posting weekly outlook and trades for next week soon. Short covering reports are coming for the 3 involved banks & Puts being put down.Setting a well organized stage for Rate cut & in Monday market is likely see some good movement in these three banks(SBI is already flying)& stock specifics on the basis of Advance Tax Number on the back drop of Global negatives.Who knows it may start in Monday itself ..continue upto RBI declaration.Then who knows what.... in most probablility 25bps & big cut would be reserved to May. I have purchased one lot of SBI 2000PE @ 3 & planning another 2050 PE at sub 1.0 when SBI crosses 2300 purely for education purpose.